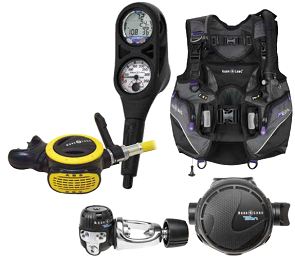 The full line of Aqua Lung equipment is available from Scuba Center. Sorry, no product substitutions with this package discount. The Pearl is a wrap-around jacket style BC specifically designed for the female diver. It offers an adjustable waistband and specially curved shoulder straps that provide a customizable and comfortable fit. 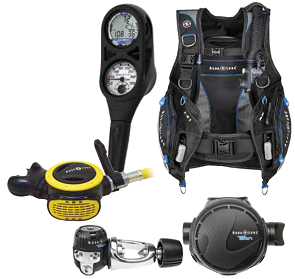 The Pearl features the patented and innovative SureLock™II mechanical weight release system. The SureLock™II is even easier to load than its predecessor and remains secure until you want to release it. The Titan incorporates the best features from the first two generations plus sprinkles in some Aqua Lung know how. The result is a comfortable, light-weight, easy-breathing regulator that is filled with innovation. From the consumer that wants performance at an affordable price to the dive center that wants ease of maintenance, the Titan delivers. Uses a balanced-diaphragm mechanism. This results in ease-of-breathing and consistent performance while environmentally protecting the internal parts. New, mid-size, high performance, demand valve second stage. Easy-to-grip venturi knob stops unwanted freeflow when the regulator is out of your mouth. The ABS Octopus combines excellent breathing performance with the benefits of a low profile body style. Exceeds CE breathing requirements for regulators. Versatile design allows proper function when right side up or upside down. Unique 120° angle between hose and mouthpiece: This Aqua Lung innovation is ideal for giving your octopus to a buddy - will work in either right hand or left hand positions. No more sharp bends in the hose or upside down octopuses in the mouth. Custom quick-release mounting clip keeps the ABS properly located on the body at all times. Its effortless approach and versatility give you the ability to dive right in. It exceeds expectations—with many features such as its easy-to-use interface, flexible operating modes, built-in backlight and user-changeable battery with data retention. The i300C carries all of these features with a ruggedness that you can count on. And with effortless design, such as a water-activated on switch, it gets you right in the water and descending to your next adventure.